ihana Youth Choir is now in its seventh season, going strong and building its membership. 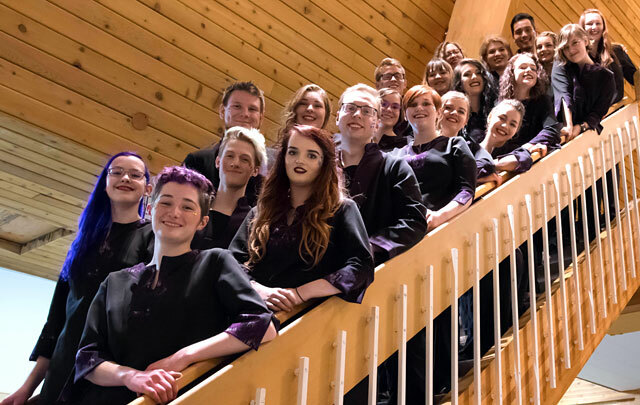 Members of this choir are ages 14 – 22 and the choir currently has 24 members from communities across Central Alberta. This enthusiastic and very energetic, close-knit group of teenagers and young adults work together to enrich their lives and the lives of everyone they meet through song. ihana is a Finnish word that means wonderful, marvelous, and is a fitting way to describe this choir and the many experiences they share with one another. Active at a local level by participating in community events, charitable activities and concerts, ihana has also gained a reputation as one of Western Canada’s outstanding vocal ensembles. As a regular participant at the Cantando Showcase concerts in Edmonton, Sun Peaks and the Canadian Rocky Mountain Festival, ihana seeks to continually learn and strive for excellence. The group was honored to have the opportunity to participate as a featured performing group at the National Podium Choral Conference in May 2016.